There is another way of cooking pizza. It is through using the barbeque grill. The good thing about this cooking method is that you will get the crisp, golden brown and tasty pizza economically. The best part is it only takes a couple of minutes or so to have it cooked with the use of the grill. There will be that distinctive taste you that your taste buds will have to differentiate against an oven-cooked pizza. The best part is you can top the pizza with your favourite toppings while it is cooking and can smell the aroma while it is being cooked. Preheat the barbeque grill and let it sit for a high temperature. Then after that you brush the grates slightly with the use of olive oil. If you choose to make your own dough, you can do so. However, if you opt for a faster pizza without making the dough buy ready-made dough from a parlour pizza or you can get hold of frozen pizza from the grocery store. Get hold of a rolling pin and slowly stretch the dough until it reaches the thickness of about 1/4 inch. It would be much better if you sprinkle a dash of flour on the table where you will roll the dough. It makes rolling lot easier and quicker. Then, brush the pizza dough with olive oil. This needs to be done on both sides after which place the dough right on top of the barbeque grill. Wait for about 2 minutes and turn the pizza crust over. Next step will be covering the top portion of the dough with sauce. Sprinkle the dough with either sliced or grated mozzarella cheese. After which, add on your favourite toppings which you want to put into the pizza. Put on the lid of the barbeque grill and let the pizza cook until such time the crust will turn in to golden brown as well as the cheese will start to melt, get hot and bubbling. With a hot grill, cooking time will be about 5 minutes only. 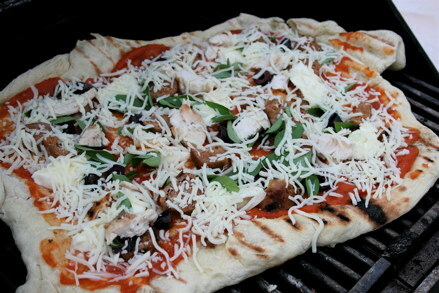 With the use of a pizza paddle, get the pizza off the grill. Let it sit for a minute or so and serve.